The Numpties took a deep breath when we saw Mr E’s name at the top of this one. We’ve seen him at the E and of the magpie puzzles and we don’t usually have a couple of weeks to spare so we don’t attempt those. There was nothing for it – we waded in. Surprisingly, the clues were solved fairly quickly. Perhaps we were encouraged by the habitual Listener compiler tipple. We couldn’t see any alternative for ASTI in 8ac ‘What could be most interesting in test? This Italian white (4)’ and ‘I’m rarely stupid unless I get drunk (7)’ – that was a kind gift of an anagram, giving INSULSE. There was another fascinating new word to drop in nonchalantly too, ‘Noticed any TANIWHAS around lately?’ (Water monster hoisted a sailor say? Nothing in it (7) A HAT round NIX rev – but that X had to go in as a W. Aha!). Now we were starting to produce a few examples of word play that gave us Xs or Ys instead of the letter that was to be entered. I wasn’t sure how these were going to produce the coordinates, so kept a faithful record of the letters that went into the grid and, as our fill developed, we noticed that the down Xs and Ys seemed to anagram to TWO/TEN. Could those be the coordinates? We thoroughly enjoyed a couple of clues along the way. There was that lovely UNNOTICED that came from ‘Warm perhaps, after middle of June – in camouflage? (9)’ (I’m reminded of that exchange between James McNeill Whistler, was it, and his friend Oscar Wilde. “I wish I’d said that!” “You will, Oscar, you will!) and the amusing use of Us in ‘Marks cars moving around on lines above us? (7)’ Brilliant that one! Well there has to be a numpty red herring each week and this week there was a second one. No, not the Maginot Line, our letters were OSTUEGORGMICO and do you know what they anagram to? GO-GO COSTUMIER! I know we had a descent into football culture with Arsène Wenger and Arsenal this year and some of us muttered about that but really, this was going just one step too far! We hummed and hawed and grumbled our scorn and disgust and set to to find out about sixties fashion, go-go boots, Mary Quant, André Courrèges and Yves Saint Laurent. Eventually, since none of those appeared in any ‘congruent’ line to the GO-GO COSTUMIER one, we had a dinner pause. Always a good plan at Listener moments like these. We returned refreshed and wondered whether our editors had really lost the place to that extent. No, surely those letters must produce something else? Like a shaft of brilliant light it came, ‘COGITO ERGO SUM’. All we had to find was RENE DESCARTES. The other numpty was in a muttery mood after all the go-go boots and swore that the second line, parallel to the first, was not actually congruent, but it was fine for me, as it produced EANECDRTSRESE. That couldn’t be pure chance. Finished! Well, not quite. What was that bit about ‘The answer to the second question, ‘And whose line is it, anyway?’ is entered across, jumbled with just one letter changed’? I am not going to admit, here, how many potential solutions I found in the grid. Again, I was muttering about the editors letting that one through if, for example, the SEODCDRA of the fourth line was going to change its O to a T and use the ES twice. What a sly dog, Mr E and no wonder we were not required to highlight that one. It’s Sunday afternoon now, and I have just put pink highlighter on the words ‘ENTERED ACROSS’ in the preamble (of course, if you jumble them, you need to change the O of ACROSS to an E!) It was a delightful little addition, though, wasn’t it? Thank you Mr E for a pleasant work out with a tough endgame. Stick Insect’s third Listener this week. It comes a year after Lawbreaker, in which MAXWELL’S DEMON required highlighting, not in contiguous cells, but jumping the two central rows of the grid. I wondered what trick he may have up his sleeve this week. Well, for a start, he had decided to supply us with only 16 clues which needed to be fitted into a circular grid … without clue numbers! I spied a tough period of cold solving ahead, followed by a somewhat interesting endgame relating to the Nth letters of clues. Surprisingly, I needn’t have worried. Clues 1, 2, 3, 4 and 5 were straightforward, with only a little bit of help from Mrs B. Clues 6, 7 and 8 also fell easily, and Stick Insect was helping us with easy anagrams or initial letters. Then I came to clue 9: Switch opening from language of disease. No luck after a couple of minutes spent on this, so on with 10, 11 , and all the others through to 16, although clue 12 held me up a bit before leading to TUNAS. Back to 9, and I was still stumped. A bit of analysis of the middle letters of all the answers I had showed that clue 9’s mid letter was a B and ran adjacent to CABER. I started slotting the answers into the grid, and soon got RABIC as the missing answer and the grid was ready within an hour of starting. I couldn’t believe that I was done so quickly. OK, the grid may need a bit of rotation, but I felt that identifying the Nth letters of the clues would be fairly easy. We were told that N was provided by the number in the outer cell with a dot, and of the eight permutations, four would lead to a meaningful thematic hint. The grid I started with is shown on the left, and had a 9 in the dotted cell but that led to rubbish, so I moved the grid through 90 degrees so that 12 was in the dotted cell. Still nothing. And the same for 11 and 8. I was stumped. Surely pivoting the grid around the 9-11 axis would still give the same set of letters for the dotted cell! I decided to try the grid fill again to see if there was another devious solution. Luckily (and I empasise luckily), I got a slightly different grid. This time, it was 13, 2, 10 and 7 that would go through the dotted cell. It was, of course, the same grid as the first time, but pivoted around the horizontal axis not the slightly skewed 9-11 axis. The outer dot had stupidly made me think that that was the point about which I should pivot the grid. … four perfect descriptions of the Voyager spacecraft, 1 and 2, both launched 35 years ago. Finally, we were required to draw two thematic lines through the dots in the grid, and these would obviously represent the trajectories of the two missions, carefully passing through only the cells containing VOYAGER 1 and 2. That fixed 2 in the dotted cell so that the trajectories ran from dot to dot, representing the planets Earth, Jupiter, Saturn, Uranus and Neptune. I tried (unsuccessfully, I think) to show that Voyager 2 was actually launched before Voyager 1, but was soon overtaken. The animation below shows the point perfectly. 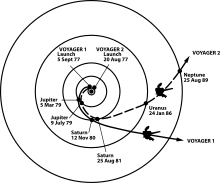 Another interesting point is that after flying by Saturn, Voyager 1 was flung northwards away from the ecliptic plane, while Voyager 2 was flung southward after its encounter with Neptune. An absolutely first-rate puzzle from Stick Insect. I wondered how long I would have been held up if my second grid had been identical to the first. Perhaps I would now be awaiting the solution, having been stumped. This was another preamble that reminded me of Asterix struggle with bureaucracy where he needed paper B to get paper A, but couldn’t have paper B if he didn’t have paper A. It sounded as though we needed to know what clue number was in the dotted cell, in order to work out which clue number went into the dotted cell. This is Listenerville isn’t it? With only sixteen clues and all of them in place after about thirty minutes of solving, things were looking up. What’s more, we could see how these words were going to fit together. Certain pairs of letters had to fit into the centre of the grid, the AV VO VA OV group, the OO, OC, CO OY group and so on. This was great fun and before very long we had all sixteen words neatly meshing to complete the grid. ‘Eight possible orientations’? I could see four, as there were four sets of four clues that had to move as a group. I must have been extraordinarily lucky to have put my clues in the grid in the direction that gave 2, 9, 1, 14, 10, 12, 5, 4, 7, 11, 6, 16, 13, 8, 15, 3. It was long after completing the solve, finding those wonderful hints and understanding where the lines had to go that I suddenly understood that the entire set could have been entered in reverse. Would we ever have seen the hints? It took us long enough, anyway to understand that we were using four of the possible orientations (we had only seen four!) but those seemed to suggest the 2nd, 10th, 7th and 13th letters of the clues reading round the grid in the (fortunately) clockwise order I had entered them in. (Well, actually my first message read ‘IONS TWO SPACE MISS’ so clearly there was some adjusting to do. My Voyager would have been one of the ones that exploded or disappeared!). The remaining hints appeared, LEAVING FROM EARTH PASSING GAS GIANTS FLYING TO THE STARS, and although my grid was launching them from somewhere in the South Pacific rather than Cape Canaveral, I managed to work out that the letters in those cells were spelling out Voyager 1 and Voyager 2. Amazing, Stick Insect! Of course, Wikipedia produced exactly the diagram that Mr Green will be looking for. This really was a spectacular puzzle. Is Waterloo making a subtle dig at himself in his title or warning us that this Listener solving addiction is leading us nowhere? Ah, we don’t have to read far into this beautifully short preamble to understand that the grid is going to be ‘pointless’. In retrospect we reflect that no other title would have been so appropriate. I’ve commented before that short preambles seem to lead to long solves. Will this be the case? Clearly, we are not going to be sure that we have entered clues correctly until several, if not all, are in place. We set to work and the first few of these very short words (somebody told me the crossword has a 5.3 average word-length or thereabouts) fall into place astonishingly quickly. Within an hour we have well over half of them and a good idea of how some of them fit. We notice, along the way, of course, that Waterloo is a confirmed member of the Listener Compiler Tipsy Club with his ‘Stopping drunkenly nearly all night (7)’ (HALTING = AL[l] NIGHT*) and ‘Detective gone mad with spilt gin caper (10)’ (Oh my, that was difficult – as were a number of these clues! PI – Private Investigator, + GONE* W(ith) GIN*, to give a ‘caper’ or a leap in a dance). Fitting them into the grid is fun and we work from the top downwards, leaving a few ambiguous cells along the way. MISER, for example, might begin at 11 and move to the right, then SE to an R or it might go upwards, then go SE, putting an R in cell 12. That would easily be resolved if we had solved 12, ‘Almost enjoying the favour of old instinctive knowledge (5)’ (INWIT[h]) – but at this stage we had a yawning gap there and were wondering whether RISER would fit the definition. Fortunately, some words, like PSEPHISM at 31 and ISLET at 27 dictated the mode of entry so that a skeleton grid appeared. I was particularly amused by the words that had a U-turn built into their structure so that they used the same cell twice. BLEB, for example, CORNO, TINT, ODSO and DYED. 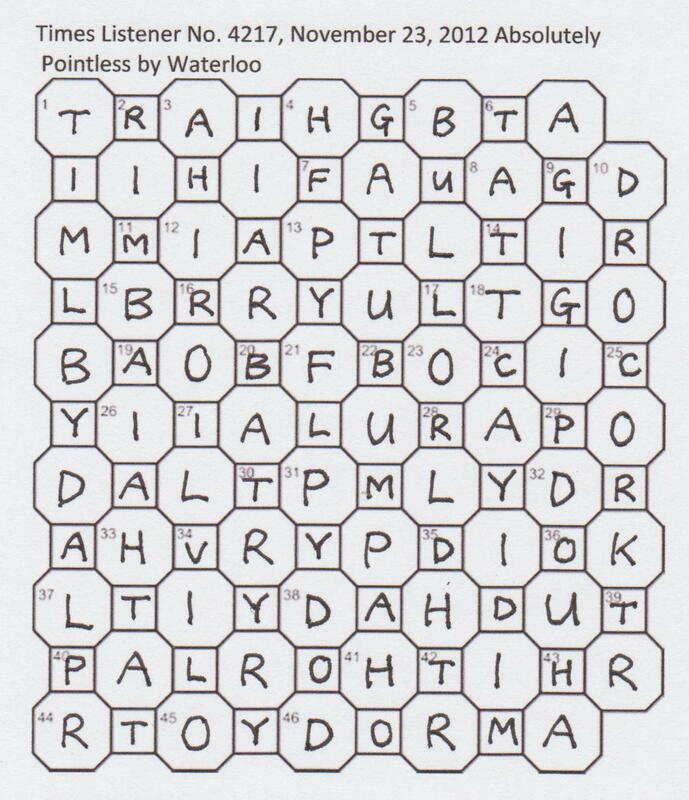 Seeing these made me wonder how many other words that Waterloo chose not to use are hidden in the grid. However, he gave us enough to complete every cell, with some lovely long words meandering enchantingly around like ROWANBERRY, COWPARSLEY and BRAINWASH. This was different and fun. Thank you, Waterloo. This week, we had to enter answers, but omit any compass coordinates which will dictate the direction that the following letter(s) were entered. I’m sure we’ve had something similar before, perhaps even from this quirky setter. I was unable to locate such a puzzle, but remember Waterloo’s fiDlEDE where repeated consecutive letters had to be entered in capitals … and in red? I presumed that every answer had at least one of the eight relevant compass coordinates: N, NE, E, SE, S, SW, W and NW. I also presumed that a word wouldn’t end with one, although it wouldn’t be a problem if it did. The main problem with this puzzle was that the initial direction of entries could be in any one of the eight, although entries starting in squares (as opposed to octagons) were obviously limited to four directions. A lot of the clues were fairly easy, and I made good progress with well over a dozen in the first twenty minutes. I had a lot of the top half of the grid completed, when I found myself wondering where I’d gone wrong! I had 29 Detective gone mad with spilt gin caper (10), but there didn’t seem to be anywhere obvious to put it, apart from the P in its starting cell, courtesy of 25(i). I saw PIG going upwards, and thought the clue was referring to the slang, and somewhat abusive, word for policeman. It wasn’t that, of course, but PIGEONWING (PI + GONE* + W + GIN*) snaking upwards in four directions eventually manifested itself. My favourite clue was the aforementioned 25(i) Plant where Morris made cars outside capital without one (10). Although I could see that it was referring to the factory where Morris cars were manufactured in the 50s and 60s, it took me a bit of time to remember it was at Cowley, and here we had COW-PARSLEY (COWLEY outside PAR[I]S). Not too difficult a clue for those UK residents of a certain age, but probably a pain for overseas solvers. I was surprised that the whole grid took over three hours to complete. Eking out the last few clues took a long time, with 19 Trouble with illness in decent (6) and 44 This bit of step behind curtain means shorter work (7) leading to ABSEIL and RAISER respectively. It staggered me that I took so long to solve them. Never mind. I got there in the end, and another little vignette from Waterloo bit the dust. Thanks.